Lorentz symmetry states that the outcome of an experiment does not depend on certain aspects of its surroundings, namely the velocity and the direction of its moving reference frame—properties that become relevant when studying astronomical objects and launching satellites, for instance, as well as for unifying quantum mechanics and general relativity. 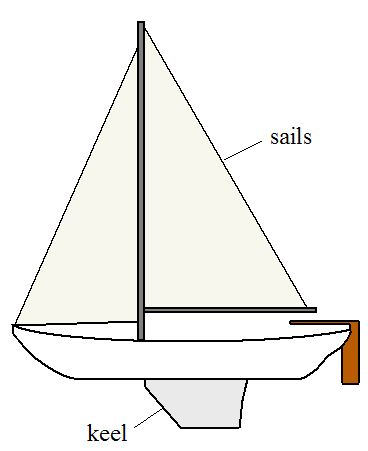 Vectors are used in sailing. They are represented by sideways and forward components, as explained below. Looks like Moana needs that science after all. The physics behind sailing is very interesting in that sailboats do not need the wind to push from behind in order to move. The wind can be blowing from the side and the sailboat can still move forward. How is this possible? The answer lies in the well-known principle of aerodynamic lift. Imagine you are a passenger in a car as it’s moving along, and you place your right hand out the window. If you tilt your hand in the clockwise sense your hand will be pushed backwards and up. This is due to the force of the air which has a sideways component and upwards component (therefore your hand is pushed backwards and up). In a similar fashion, when the wind blows against the sails from the side, this creates a force which has a sideways component and a forward component. However, we do not want the sailboat to move sideways. We only want it to move forward (as much as possible). This is accomplished with a keel, located underneath the sailboat. The keel provides the counter-force necessary to resist sideways motion of the sailboat, as much as possible. So in general, there are two main components of a sailboat which enable it to move forward effectively. They are the sail and the keel, as shown below. Thus, the physics of sailing involves the interaction of the wind and sails, and the interaction of the water and keel. Wassup, I’m Christine Felizardo, but you can call me Christine. Honestly, I was in a very “WOO YES PUMASA NA AKO NG 55 PWEDE NA AKO MAG-130” mood. Although, I didn’t think too much about what I’ll expect from this subject. I do know there’s a lot of math yet again, but that’s pretty much it. The second time was the real game-changer. I didn’t think too much about what I felt about math when I took 53 and 54, but by the time I was taking 55 I was like wow, I actually love math. I feel like it was largely because my prof now was once again part of the wonderful & kind ones I mentioned earlier, which I am super grateful for since it changed my attitude on 55. There’s just something fun about double/triple integrals, or drawing an elliptic paraboloid, or even solving for whether this equation was convergent or divergent. Sure it would frustrate me to an extent when something wasn’t right, but I mostly channel that frustration to checking what I’m missing, then trying again. Math was a constant cycle of learning. I eventually got to appreciate the complexity of it all. To sum it up, I’m comfortable with Math. I’m hopeful about the coming semester, and even the coming months of 2017. I’m expecting a lot of crying occurring in the near future, but that’s what adds spice to life, honestly.